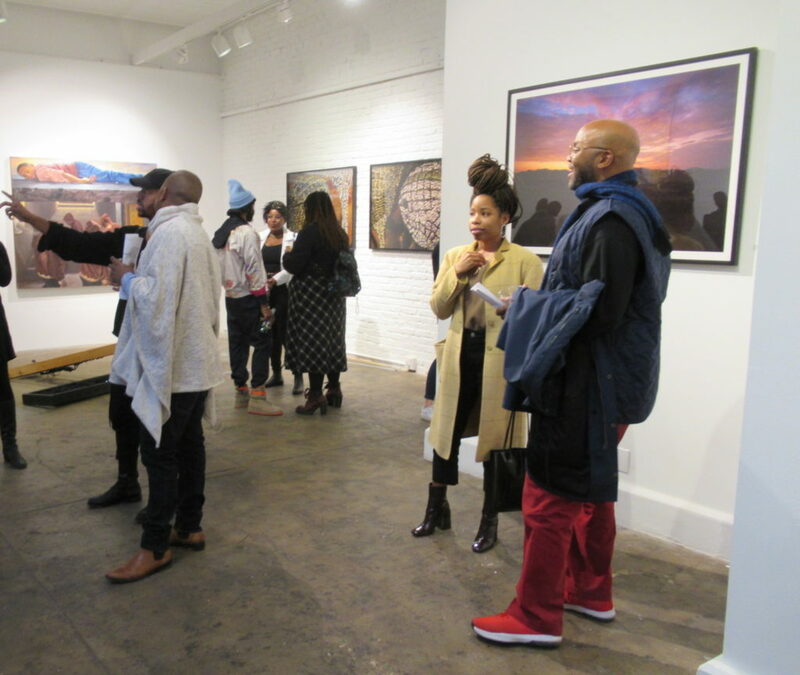 Whenever I attend an opening at projects+gallery, I find myself as fascinated by what the crowd is wearing as much as by the art on the walls. 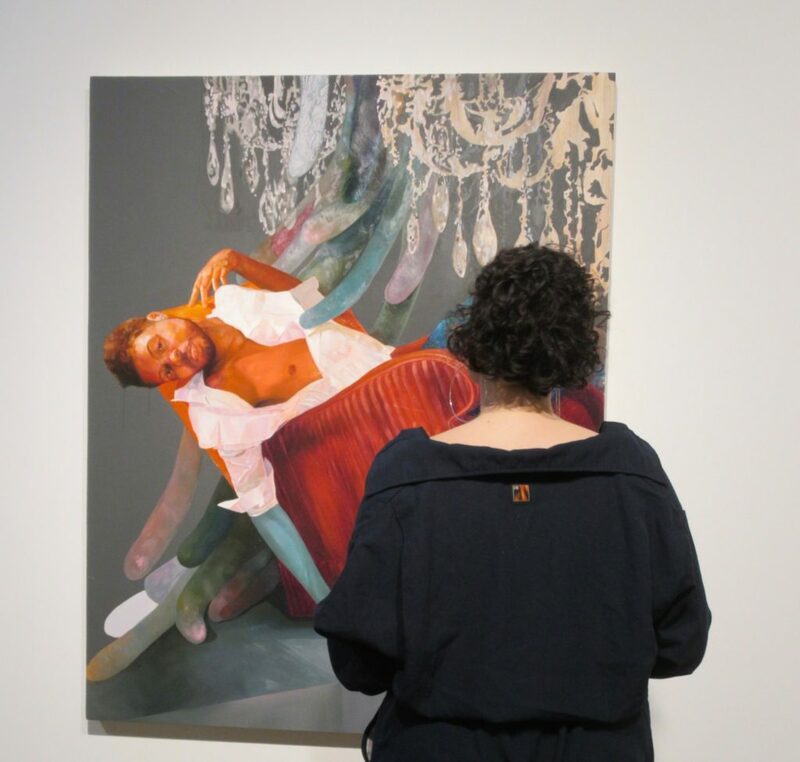 Fashioning the Black Body, which opened Friday March 15, and the artists talk the following day, led me down the same delightful path. The exhibition is Dario Calmese’s, above right, curatorial debut. He is a multi-faceted artist who was the creative force behind last year’s wildly popular exhibition at projects + gallery titled Amongst Friends. Artist David Antonio Cruz’s painting, above, is titled thereturnofthedirtyboys/girls. 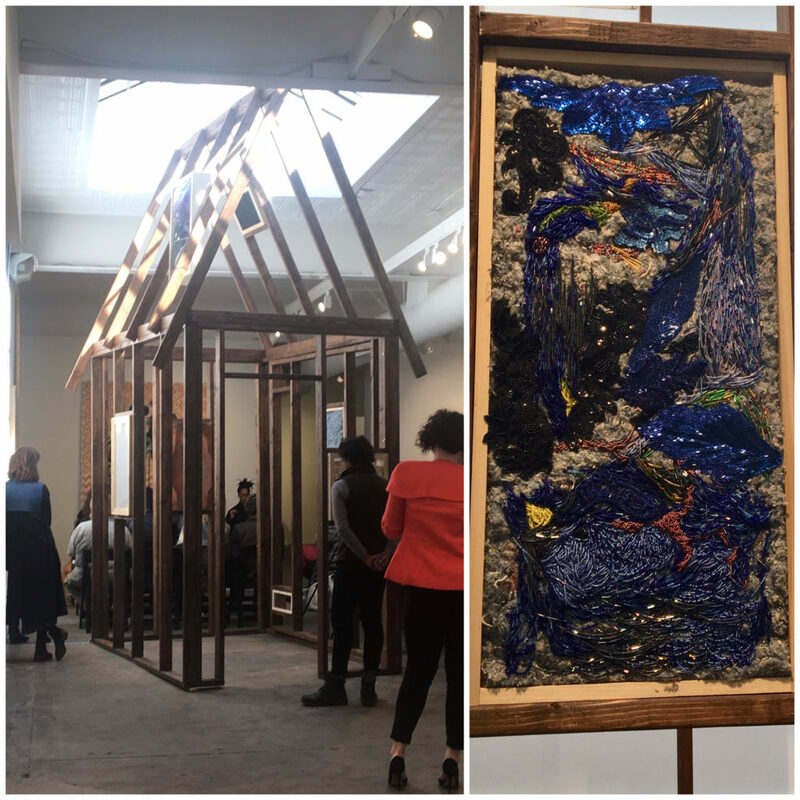 Kenturah Davis’s wood frame structure with embroidered panel, right. projects + gallery’s Senior Director Bridget Melloy, standing far right, introduced the artists’ panel Saturday. 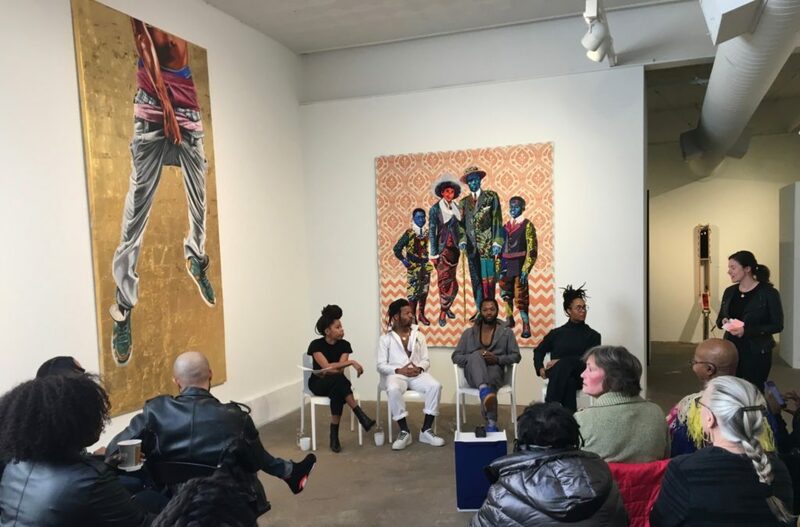 Those include from left: moderator Rikki Byrd, who until recently was on the faculty of Washington University’s Sam Fox School of Design, and is now a PhD student at Northwestern, Curator Dario Calmese (wearing projects + gallery SPACEWALKER), St. Louis-based artist Basil Kincaid, and Kenturah Davis, who earned her BFA from Yale and divides her time between L.A., New Haven, and Accra (Ghana). 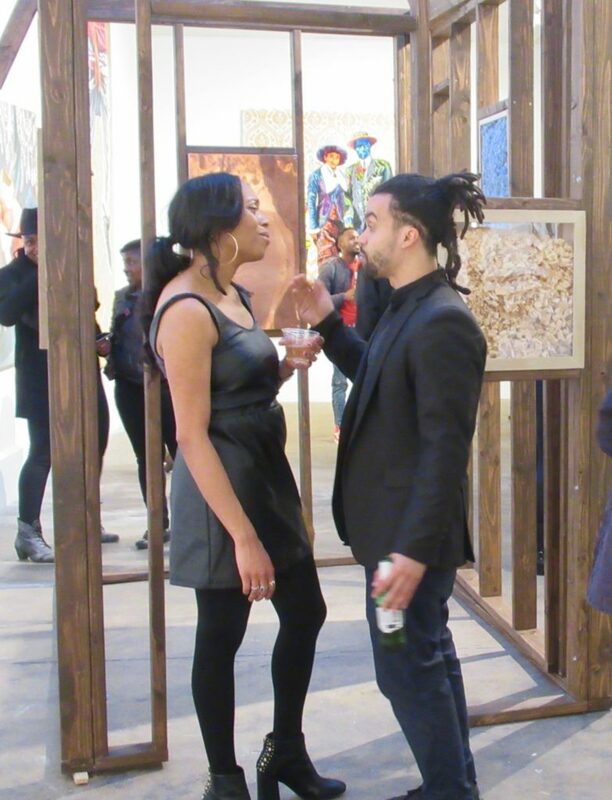 When asked how he chose the art for Fashioning the Black Body Calmese explained that many of the artists are friends he’s worked with in the past. Left: Kehinde Wiley’s After Pontermo’s Two Men with a Passage. 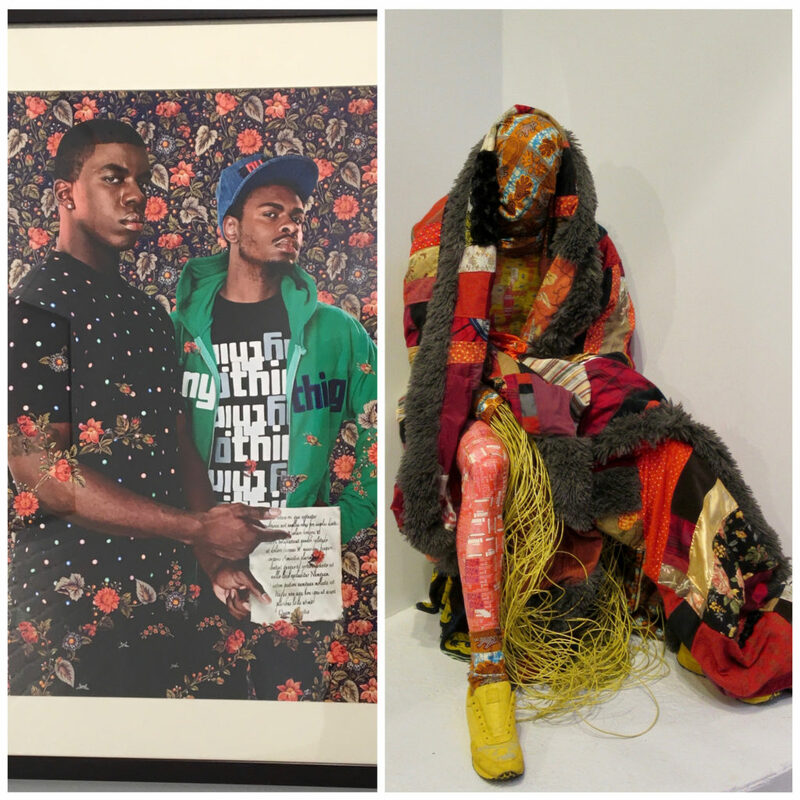 Right, Rikki Byrd singled out St. Louis-based Basil Kincaid’s quilt and mannequin Special Spot, above right, to demonstrate that black people have historically found ways to make something out of nothing. 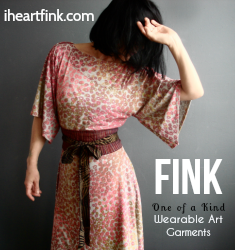 Kincaid used various donated fabrics and waxed batik from his travels in fashioning his work. 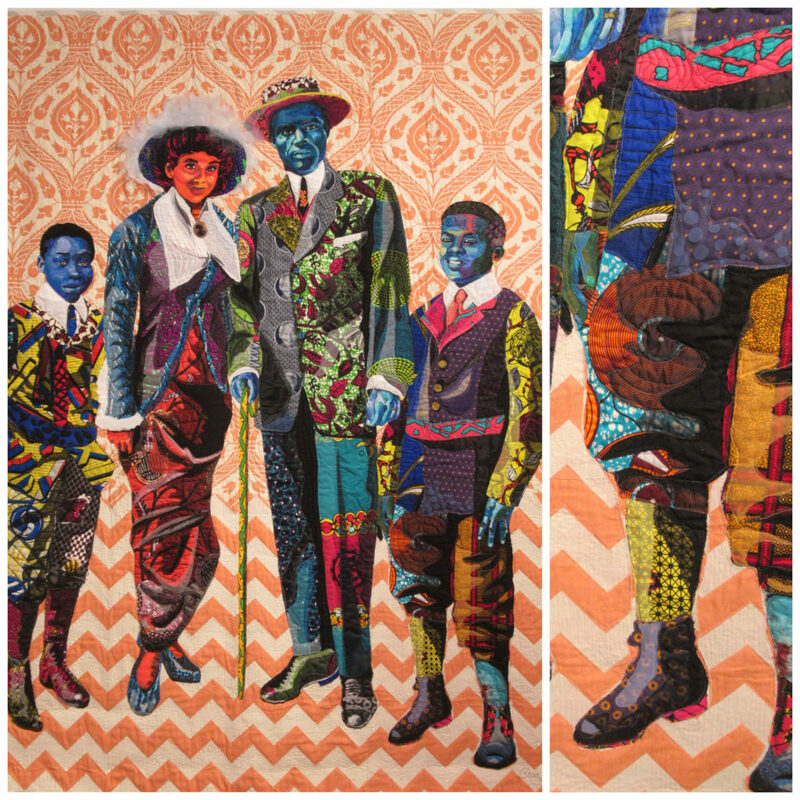 Bisa Butler’s 85 x 79″ quilt, Black Star Family, first class tickets to Liberia, 2018, cotton, silk & denim. 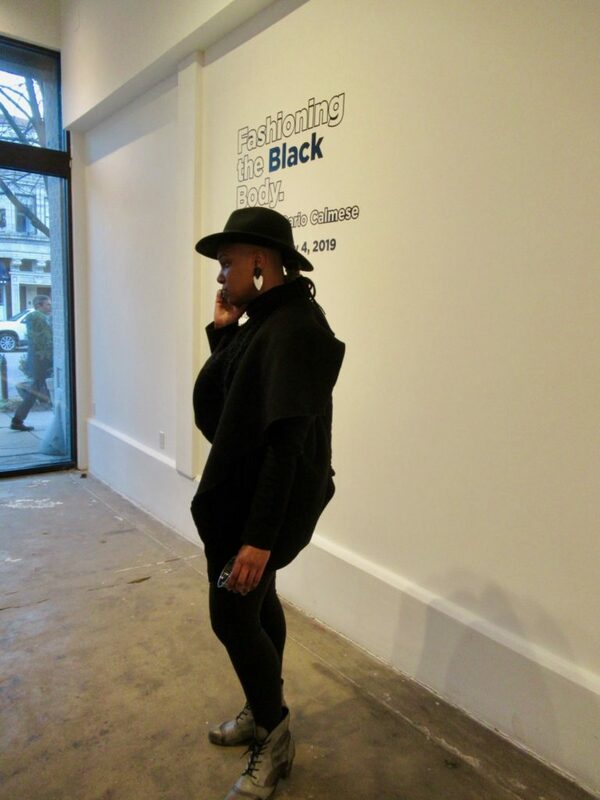 Fashioning the Black Body will remain on view at projects + gallery, 4733 McPherson Ave., until May 4.